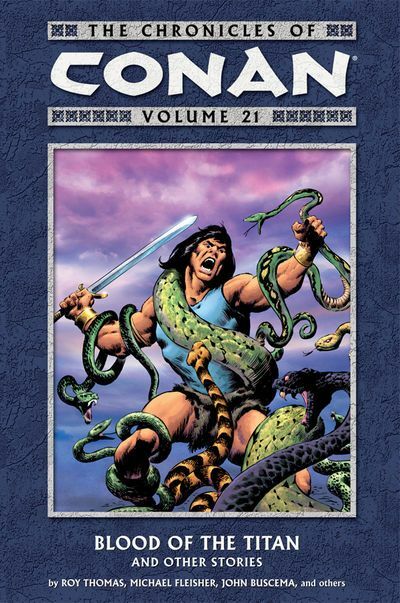 Only one man has called Conan "Little Man" and lived to tell the tale -- Fafnir of the red beard, friend of Conan, brawler, and general tavern body, makes his triumphant return to action in this volume of The Chronicles of Conan, and none too soon! Conan will need all the allies he can muster if he is to survive a witch that commands a demon arm, a man-mountain known as Gargantax, and a crafty immortal who would remain that way at all costs! But will helping Conan be a one-way ticket to the afterlife for Fafnir and the rest of Conan's allies? * This volume collects Conan the Barbarian issues #160 to #167 and Conan the Barbarian Annual #7, now with new colors, an insightful foreword, and new art by Ernie Chan! * Featuring a King Conan story by Roy Thomas and John Buscema! * Ernie Chan answers the age--old question, "Who would win in a fight, Conan or Kull?"